Hi guys! 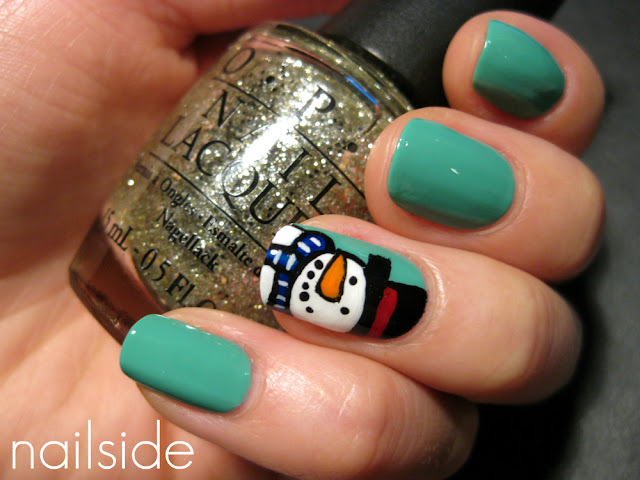 For this post I've made this chubby little snowman design by Rins from Simply Rins. I saw it on her blog just a little while ago and fell madly in love... I couldn't stop looking at all ten of them on her nails, because they're just too cute! So many, many thanks to Rins for this adorable design! Seriously, don't you want to hug it? ^^ I used acrylic paint to draw the snowman and the base color is Essence Viva La Green. I love the color because it's not that typical mint green that we've come across many times in the past few years. It's a bit darker and quite vibrant, although it doesn't really show in the pictures (where I'm holding OPI Spark The Triomphe as decoration heehee). Rins also made a tutorial for this design which you can find in the orignal post here. 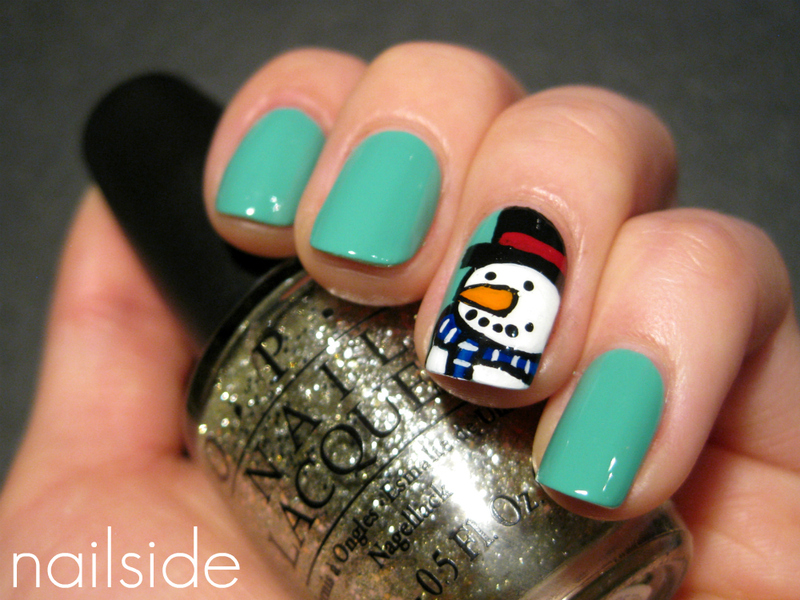 Make sure to check it out, as well as the rest of her blog, she's created plenty of other amazing (freehand!) looks, very inspiring. You did such a great job with this manicure!! :D I love that base colour! Yeah, I want to hug it. ^^ So cute! you are talented in painting! SO cute! And so well done!! Oh goodness this is too cute!! Oh my, again, it's so perfect, so right and so adorable! I saw the post last week, and I had to have it. But of course it did'nt came out like Rins' or yours. But both of you have an art to make it look really easy. And if any of you happen to know Erika from Chloe's Nails just send her good vibes. I wish you happy x-mas holiday & a happy 2012!!! Your chubby snowman is charming! i came across your blog today just by coincidence and i love it! @Anonymous: Many good vibes to Erika! <3 I really hope she's doing well and coming back soon. She's being missed very much. @Mary Ann: Of course I'm not angry with you sharing my blog! The diagonal mani looks awesome, it's one of my favorite designs, so simple yet effective ^^ Happy Holidays to you too! @Rins: You're very welcome, thank YOU for your amazing ideas :-) I hope you had a lovely Christmas!